For the 13th year, Bloomingdale’s continues its commitment to support breast cancer awareness and treatment during the month of October. This year, the retailer again invites shoppers to participate in the cause with exclusive products and events promoting good health and wellness in support of the Breast Cancer Research Foundation (BCRF), The Carey Foundation and the Marisa Acocella Marchetto Foundation. Donald Robertson x Bloomingdale’s – For the third consecutive year, Bloomingdale’s has partnered with world renowned career artist Donald Robertson for this year’s Breast Cancer Awareness campaign. 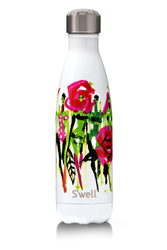 To support the cause, Bloomingdale’s worked with Robertson to customize a S’well waterbottle with a signature design titled “Karma in Bloom”. The water bottle is sold exclusively at Bloomingdale’s stores and online for $35 with $19 from each sale donated to the BCRF. Robertson’s artwork will also cover the Third Avenue façade of the Bloomingdale’s 59th Street store throughout the month of October. Give Pink, Get More – Bloomingdale’s card holders will have the opportunity to opt into this annual feel-good program. Enroll in the program by charging a $15 fee on your Bloomingdale’s Credit Card, 100% of which will fund research, support and awareness programs for our charity partners. From 9/27-10/31, spend $250 or more in store at Bloomingdale’s or on bloomingdales.com using your Bloomingdale’s Credit Card and based on the amount you spend, you’ll be mailed a gift card worth up to $250 to use at any Bloomingdale’s location or online. The Little Pink Card – It’s the gift card that keeps on giving! Bloomingdale’s donates 10% of the value on your Little Pink Card, plus 10% of purchases made with this card above the original amount, to Bloomingdale’s charity partners. Donations will be on cards purchased 9/14 – 10/31 and redeemed in stores by 12/31. Pink Yoga – Shoppers are invited to their nearest Bloomingdale’s location on Saturday, October 7th to kick off Bloomingdale’s Pink Campaign with a morning yoga class in partnership with Spiritual Gangster. The yoga classes will be taught by notable yoga instructors from around the country. A reservation fee of $10 will benefit the Marisa Acocella Marchetto Foundation and The Carey Foundation which support survivors and their families with cancer related costs such as transportation, child care and proper treatment. Attendees will receive a branded yoga mat and Pink gift bag just for attending. To reserve a mat, visit bloomingdalesyoga.eventbrite.com. Last year, Bloomingdale’s donated more than $1.4 million to the Breast Cancer Research Foundation, The Carey Foundation and the Marisa Acocella Marchetto Foundation. The retailer is proud to continue supporting their exciting new initiatives. Through a BCRF grant, Bloomingdale’s helps fund five researchers focused on breast cancer prevention and treatment- Dr.Joan S. Brugge, Professor of Cell Biology and Director of the Ludwig Center at Harvard Medical School, Dr.Andrew J Dannenberg, Professor of Medicine at Weill Cornell Medical College and Director of Weill Cornell Cancer Center, Dr.Titia de Lange, Professor and the Head of Laboratory of Cell Biology and Genetics at The Rockefeller University, Dr.Marc Lippman Professor of Medicine, Deputy Director of Sylvester Cancer Center at the University of Miami and Dr.Michael Press, Professor of Pathology and Chair of Cancer Research at University of Southern California. Bloomingdale’s also supports the work of the Carey Foundation and the Marisa Acocella Marchetto Foundation. The Carey Foundation is a nonprofit that raises funds for women, men and their families to ease the financial burdens that come with a breast cancer diagnosis. The Tutu Project releases grants twice a year to create lasting bonds between its initiative and like-minded organizations. The Marisa Acocella Marchetto Foundation is a non-profit that funds treatments and services for uninsured and underinsured women with breast cancer. The Marisa Acocella Empowerment Program, made possible through a grant from Bloomingdale’s, funds innovative holistic care, cold-capping services, nutrition classes and more. The Bloomingdale’s 59th Street flagship will honor Breast Cancer Awareness throughout the month of October. The Lexington Avenue façade of the building will be lit in pink as a beacon of support to breast cancer awareness. To celebrate the fifth anniversary of the Tutu Project, the Lexington Avenue windows will display of a retrospective of Bob Carey’s photographs from throughout the years. A gallery of his work will also be on display in the arcade area. Throughout the month, the flagship will also host events to raise awareness and funds for the cause.